By Saturday, June 3 we will be deactivating all SIM cards that have not yet added associated billing information to Particle accounts. In plain English, this means that the onboard Particle Electron is yours to experiment with… as well as the awesome PCB it was mounted on. You’ll have to go through the below steps to claim it to your Particle account to continue to build great hardware. Today we’ll cover some of the questions we’re seeing about next steps. We’ll enable you to do awesome Internet of Things… things so that when we see you next you’re even better prepared for the next challenge. We’re excited for what you come up with… and can’t wait to see what you build. There is a slightly different methodology for claiming the Electron depending on whether you powered on the badge at the show or are just turning it on now. Our full write-up is on the Hackpack.cc site, but following is a general overview. Visit the website setup.particle.io and choose the option ‘ACTIVATE A SIM CARD ONLY’. If you have the Particle SIM Card punch-out that came with your HackPack, the ICCID is printed on the bottom. If you do not, skip further down in the article where we detail how to remove the Electron from the Badge PCB and further on how to remove the SIM card. The SIM card has the ICCID number to enter printed on top. 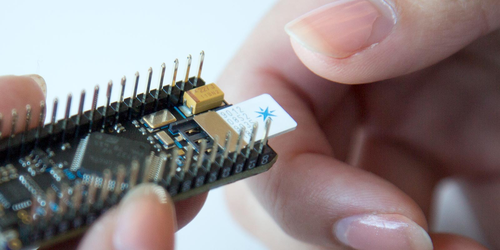 Visit the website setup.particle.io and choose the option ‘SETUP AN ELECTRON W/ SIM CARD’. You’ll want to visit the hardware portion of this article and follow the removal instructions. The ICCID is on the front of the SIM Card. To register the Electron or to use it outside the badge, you’ll need to remove it from its current habitat. Start by gently prying out the battery lead (the red/black wires with the white connector) and rocking the antenna connector (gold with the textured insulated wire) out of the socket. The Electron you received is friction fit onto female headers on the HackPack v3 badge. This means that you might not need any tools to remove it from the socket – gently try rocking the Electron back and forth or side to side to extract it from the board. If the Electron is still stubbornly attached to your board, you can use two flat-head screwdrivers and carefully pry up either side of the board. DO NOT use the bare screwdrivers, but wrap the head with a paper towel or something soft to distribute the force. You should be careful to avoid delicate areas such as small components or the SIM card (see picture of the bottom below), but slight force should be okay. Try to raise one side a bit then alternate; if you apply pressure evenly you can extricate it without any bent pins. To activate the Electron if you no longer (or never had) have the Particle SIM punch-out, you’ll need to remove the SIM card. On that SIM card there is a 19-22 digit ICCID number, which is what you’ll enter into the respective section on setup.particle.io. Note the orientation of the SIM card – the FLAT side is facing towards the outside of the board and the text is facing up with the pins. To reinsert the SIM card, apply gentle pressure and insert the angled side back into the slot. The SIM card will resist when it hits the end-guide. Do not force it further – this is when it is in the correct position. The Electron uses standard 2.54mm (.1 inch) header spacing, so it will also feel at home on a breadboard. Using a standard pitch breadboard, merely bridge the center gap and push down until it is firmly fastened on the board. Now you can use it with your jumper cables and long leaded components – neat! Want to put the Electron back in the HackPack v3 and play with the blinky lights? What a bright idea! Orient the badge so the Twilio logo is facing you, the battery pack leads are on the left and the antenna lead are on the right. Re-insert the Electron with the battery connector on the left and the antenna on the right. Pushing down on the top of the pins (yes, they are a little bumpy – you can try to grasp the edges of the board if it’s easier) push the Electron back into the female headers. It’s properly fitted when you cannot see light between the board and the plastic pin labels (pictured) on the side. Finally, reattach the cellular antenna and the battery connector. At some point – if it hasn’t yet – the battery we’ve provided will run low. The Micro USB connector on the Electron will recharge the battery, and it can trickle charge even when you are not using much power from the board. However, note that the Neopixel LEDs provided with the badge are high powered. If they are running at full brightness, the board will not be recharging… in fact, excess power above what USB can provide will be pulled from the battery. Ensure you are not running high powered lights or similar when recharging the device. Now that you’ve claimed the Electron, we leave you in the very capable hands of Particle to program it. We suggest first using it to blink an LED – after that, the world is your oyster! 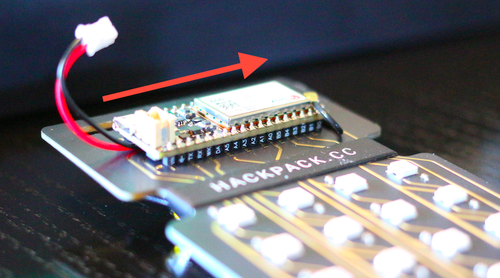 If you are still using the HackPack badge, you can base your code off our original firmware. There are 16 NeoPixels on board, addressed serially and connected to pin ‘A5’. You can use the NeoPixel library standard if you change the serial pin to A5 and continue to use the awesome blinking LED array. SMS to Morse Code translator? We’ll publish some other snippets and full-blown applications both here on the blog and on our documentation site – so this is your call to subscribe! Look for posts on the functionality of the Electron as well as a few posts on using the Electron with the HackPack badge. Additionally, visit Particle’s Electron examples for some more step by step tutorials on common applications. However, you’re the DOer – we know you’re going to come up with something amazing. And as always, we can’t wait to see what you build – promise to come back and show us!